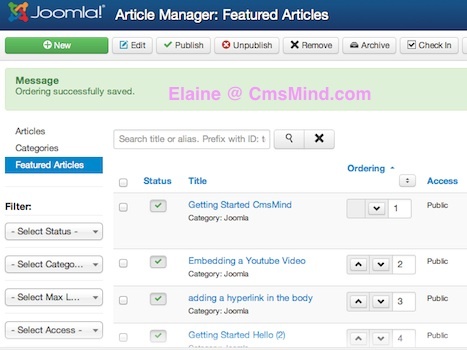 I just noticed Joomla 3.0 has a new way to order featured articles. It’s a slightly easier way and definitely easier to understand. This new way to order articles is only available for featured articles and not for the rest of the articles in the Content Manager. This is the only place where you cannot drag and drop your articles to sort them. 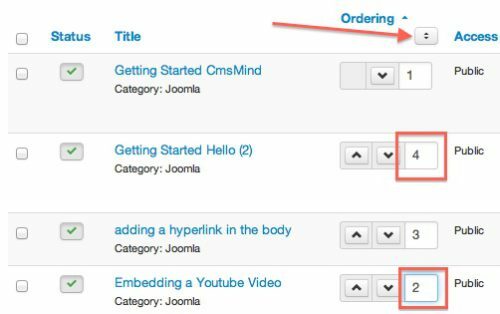 The method of ordering featured articles goes back to the same format from previous years. You can use arrows to move the article up and down or type in the order number you want it to show up in. One of your Menu items uses the Featured Articles as it’s menu type. 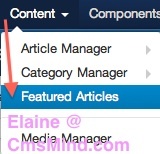 If you want to reorder your featured articles, you go to the Content Manager, Featured Articles. To initiate the manual ordering, you click on the heading ‘Ordering’. 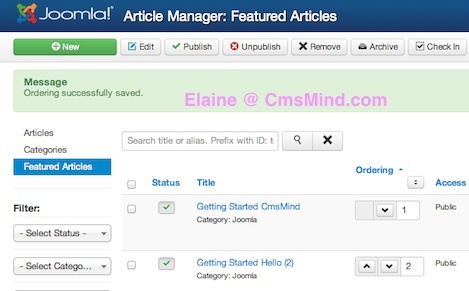 There are 2 ways to manually re-order your featured articles. The first way is to use the up and down arrows. You can re-order your Featured Articles by using the up and down arrow buttons to move the featured article below or above the next article. Right after you click on the down arrow, you will see the Featured Article order has been saved. Type the ordering you want the featured articles to appear. Click on button right below the heading ‘Ordering’ to save the ordering. You can see that after I saved the ordering, the featured articles are ordering in the sequence I wanted them to appear in Step 5. You can see by comparing Step 5 and Step 6, that my ordering is shown correctly now. 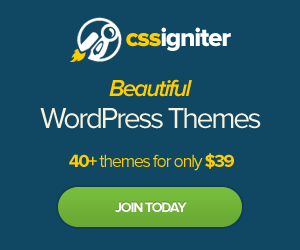 Too bad this ordering is not available in the Content Manager and only available in the Featured Articles section. I like this style of manually ordering much more than the drag and drop.